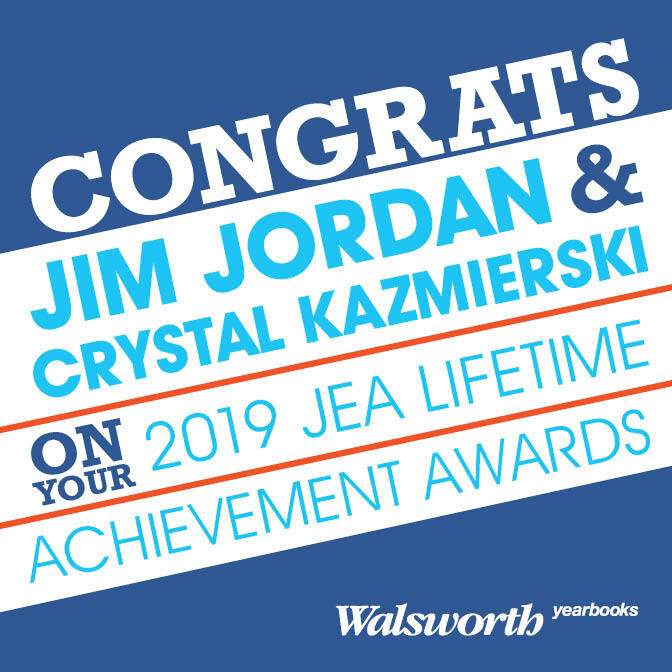 Jim Jordan, Special Consultant for Walsworth Yearbooks and former yearbook adviser of Del Campo High School in Fair Oaks, California, and Crystal Kazmierski, former yearbook adviser of Arrowhead Christian Academy in Redlands, California, were among the 10 educators to be announced as recipients of the Lifetime Achievement Award today by the Journalism Education Association (JEA). Jordan, who retired from the classroom in June 2017, advised 35 yearbooks at Del Campo and remains a dedicated supporter of scholastic journalism. He is currently the Lead Mentor for Walsworth’s Adviser Mentor Program, which provides guidance to new yearbook advisers in their first years on the job. He is also a regular instructor at workshops and recently started the “Yearbook Chat with Jim” podcast, which is part of the Walsworth Yearbooks Podcast Network (WYPN). In her 24 years at Arrowhead Christian before retiring, Kazmierski built a wildly successful yearbook program. Her staffs won 23 NSPA Pacemakers and 17 CSPA Gold Crowns under her guidance. Kazmierski continues to speak and teach at scholastic journalism workshops across the country. Both Del Campo and Arrowhead Christian are Walsworth Yearbooks customer schools. Each year, JEA gives the Lifetime Achievement award to retirees for lifetime dedication to journalism education in the form of advising or other contributions to the profession. Scholastic press associations and individuals who are JEA members are encouraged to submit names of retirees in their state. This year’s winners will be honored at the upcoming JEA/NSPA Spring National High School Journalism Convention in Anaheim, April 25-27.